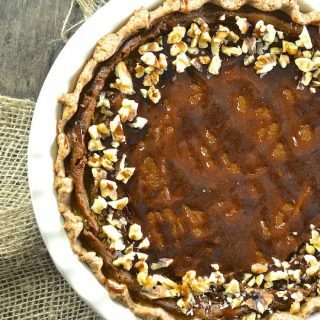 Velvety smooth, perfectly soft & custardy vegan pumpkin pie with a deliciously crisp pastry crust. 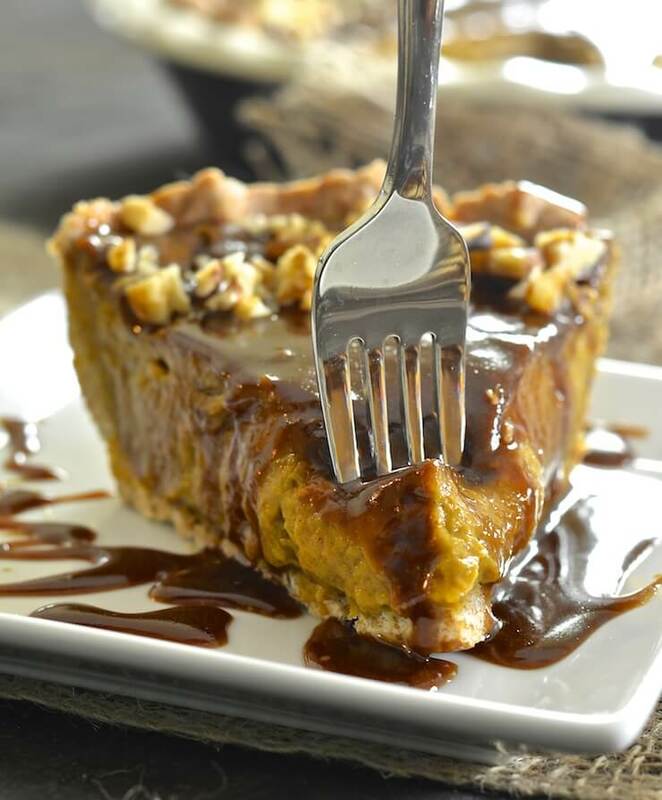 Add to that a drizzle of decadently rich, warm caramel sauce & you have THE best fall dessert! Would you believe that I had never tried pumpkin pie until about two and half years ago? It is not something you see often in England and it was only when we moved to Canada and experienced our first Thanksgiving that we ate it for the first time. At that time it was not a vegan pie. In fact, I don’t think I have ever seen a vegan version for sale anywhere. That is why I decided to come up with my own version for Thanksgiving this year. To say I’m pumpkin obsessed is an understatement. Give me my Pumpkin Smoothie for breakfast, some Vegan Pumpkin Bread for snacks and this for dessert and I would be a very happy lady! 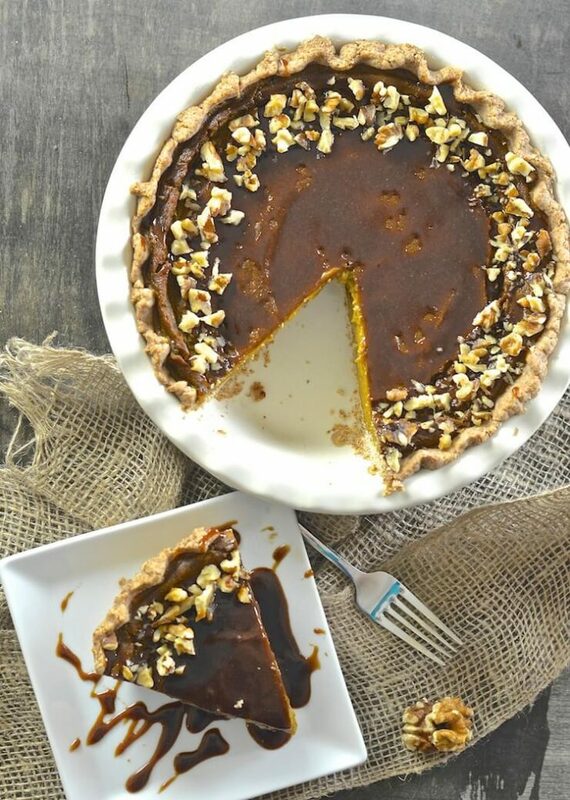 My Vegan Pumpkin Pie has a crispy pastry case, and a rich, velvety, smooth and creamy vegan pumpkin custard filling. Top that with a drizzle of the most delicious caramel sauce ever and a big dollop of whipped coconut cream and you have perfection on a plate (or in a pie dish)! It might sound like it is going to be complicated to make but I promise it’s not. The pastry is made in minutes in a food processor (you could even buy a pre-made pastry case if you like), the filling takes a minute to two in a blender and the caramel sauce five minutes tops. 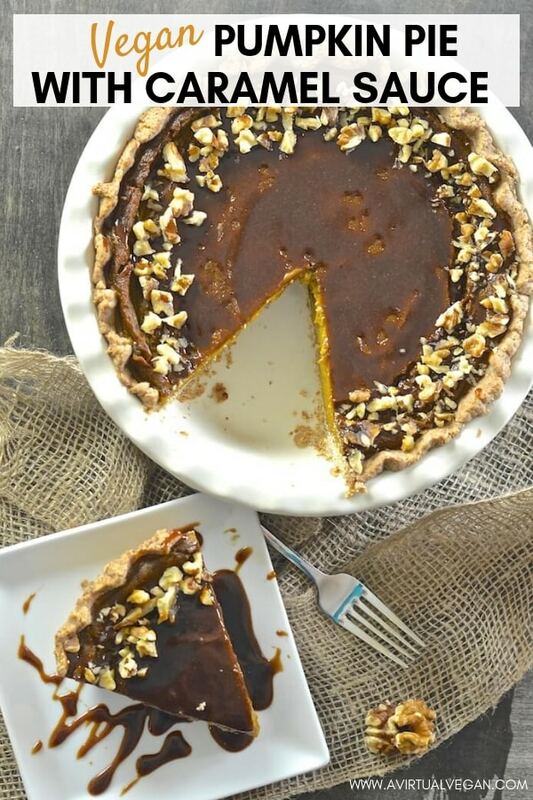 This Vegan Pumpkin Pie is so delicious and totally dairy and egg free. It is full of healthy ingredients yet tastes totally decadent. 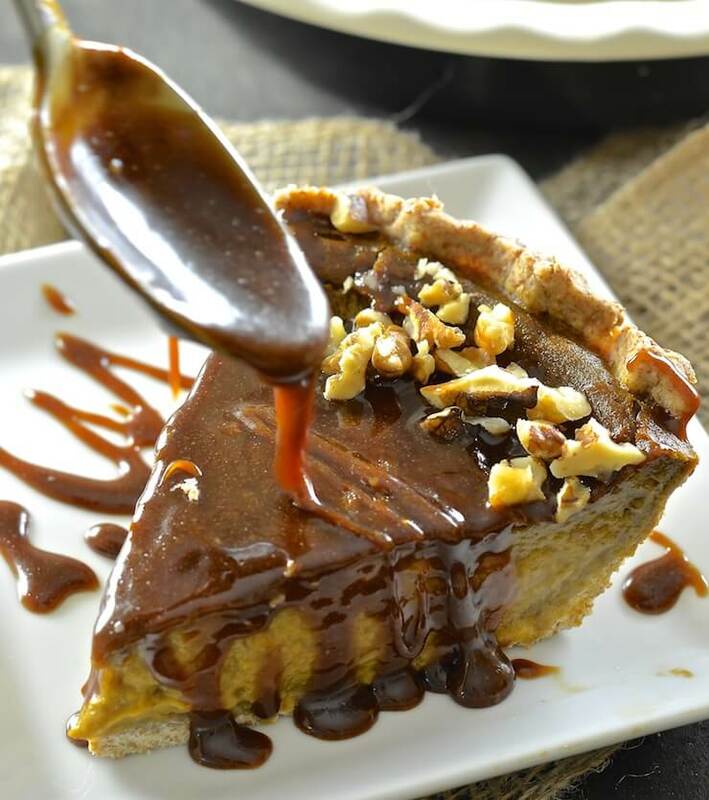 Don’t, whatever you do, skip the caramel sauce….it is to die for and takes the pie to the next level. It is also the easiest caramel sauce to make EVER! I could not stop licking it off the spoon. I am lucky there was any left to drizzle over my pie at all! A big dollop of coconut whipped cream finishes off this pie beautifully. If you have never whipped coconut cream before you might want to watch this quick video which shows you step by step how to do it. If you love pumpkin be sure to check out my Pumpkin, Pecan & Chocolate Granola Bars, my Chocolate Tahini Pumpkin Smoothie and my Roast Stuffed Pumpkin! 110g | ½ cup coconut oil It needs to be very hard. If yours is soft then put it in the fridge for an hour before you make the pastry. Add the flour, solid coconut oil and salt to a food processor and process until well combined. You might need to scrape down the edges with a spatula once. Do not over mix, you want it just combined. Gradually add your water 1 tablespoon at a time while the food processor is running. I used 4 tablespoons but yours might vary slightly. It should start balling up as it whizzes around but if you aren't sure turn it off and pull a bit out with your hands. If it is nice and soft and squeezes together easily then there is enough water. If it feels a little dry and crumbly then add a little more water. If you do not have a food processor then add the flour, salt and coconut oil to a chilled bowl. Rub the coconut oil into the flour as quickly as you can with your finger tips. Once it looks bread crumby gradually add the water, stirring with a knife until a dough starts to form and you can gently bring it together in your hands. Line your pie dish immediately, unless your kitchen is very warm and the pastry is too soft. If this is the case wrap it in cling wrap and refrigerate for 10 minutes before continuing. (I used a 9 inch dish but any similar size will be fine, it will just end up a bit deeper or shallower so you might need to adjust the cooking time slightly). Lightly flour your work surface and roll out the pastry. Pastry made with coconut oil is a little more difficult to work with than regular pastry so if you have trouble rolling it out just put the ball of pastry into the pie dish and press it into place with your finger tips. Place the lined tin in the fridge and let is rest for 30 minutes while you preheat the oven to 400 degrees F.
Remove from the fridge and line the pastry with some baking parchment and fill with baking beans or dried rice to weigh everything down and to stop the pastry rising. Place in the oven and bake for 15 mins. Lift out the baking parchment and beans/rice and bake again for 5 minutes. Leave the pastry case to cool a bit while you make the filling. Add all of the filling ingredients to a blender. Place in the oven and bake. The time it takes will vary depending on how deep your pie dish is. Mine is just over 2 inches deep and my pie took 60 minutes. If yours is very shallow then it will probably only take 35 - 40 minutes. When it is ready it will visibly 'look' set but still be pretty wobbly. Remove from the oven when it reaches this stage. Allow to cool. Don't worry if it still feels a little loose. Once cool enough, refrigerate for at least 2 - 3 hours. Longer or overnight will be absolutely fine too. Add the coconut sugar and the water to a pan. Place over a medium heat and cook until the sugar has completely dissolved and it is just starting to bubble. DO NOT STIR!! If you need to, just swirl the pan a bit. It will take 3 -4 minutes max. Remove from the heat and add the tahini, salt and coconut oil. Put back over a very low heat and stir very well until it is all well combined. It is normal to see a few little light flecks through it. Serve drizzled with warm caramel sauce and some whipped coconut cream. As the caramel cools (or if you keep it in the fridge) it will become very thick. To loosen it up again all you need to do is warm it in the microwave for 10 - 20 seconds, or in a pan on the hob for a minute or so. I used a 10 inch dish but any similar size will be fine, it will just end up a bit deeper or shallower so you might need to adjust the cooking time slightly I would suggest you weigh the flour and coconut oil when making the pastry if you want a perfect result. 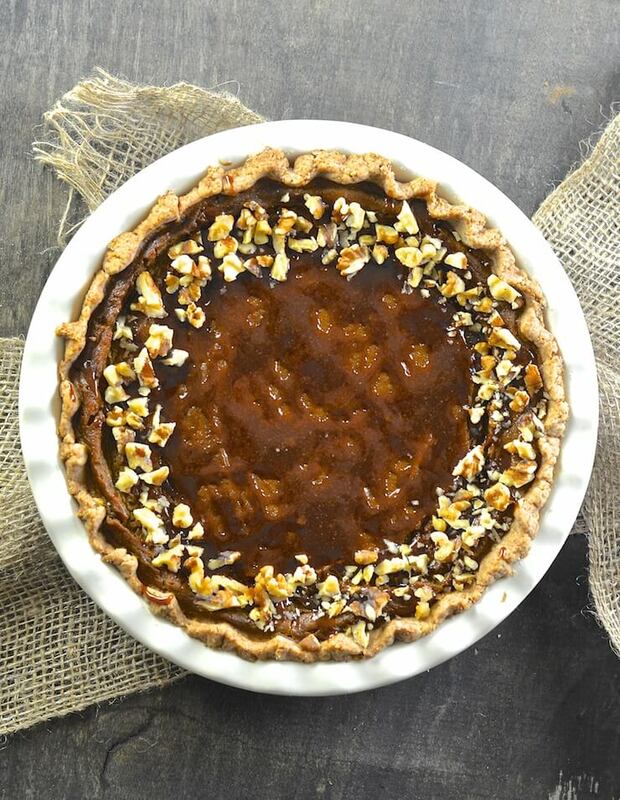 If you cannot get Pumpkin Pie Spice where you are, it is very simple to make yourself and great for adding to all sorts of baked goods like apple pies or cakes. Here is a very simple recipe. 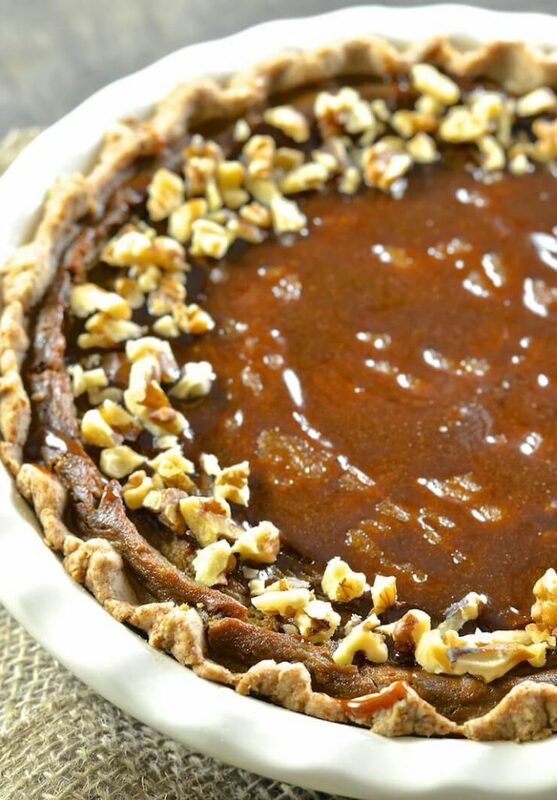 The pie and caramel sauce keep well in the fridge for a few days. The caramel sauce will firm up in the fridge but you can loosen it again by warming it gently either in a pan on the hob over very low heat or for a 20-30 seconds in a microwave. I made this for Thanksgiving since my daughter’s boyfriend is Vegan. I wasn’t too confident about how well this pie would turn out, but it was AMAZINGLY DELICIOUS. I added pecans and we used jar caramel sauce. Wow. We all clamored for a piece. It is our new favorite pie! That’s so good to hear Carol. I’m thrilled you all enjoyed it! The best pumpkin pie period. So good. Everyone loved it! This was yummy. The whole family enjoyed it! I know what you mean about keeping it warm, though my caramel was stiff even when it was warm. It didn’t ‘flow’ like I’d expect a sauce to. I almost certainly over-worked the pastry. I have just moved house and my food processor is still in a box somewhere! I’m missing it more and more! This is my new go to pumpkin pie recipe, picky boyfriend approved, so effin delicious! Cant wait to make it for the fam! And that sauce, my oh my, to die for! Thank you Mel!